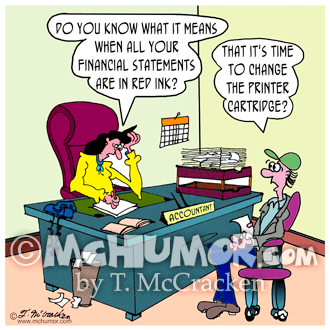 Accounting Cartoon 7885: An accountant asks a man, "Do you know what it means when all your financial statements are in red ink?" He replies, "That it's time to change the printer cartridge?" 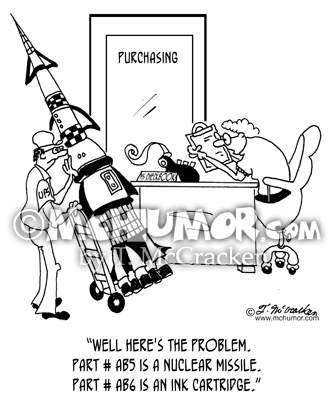 Security Cartoon 6484: A woman saying as a huge missile is delivered to her office, "Well here's the problem. Part # AB5 is a Nuclear Missile. 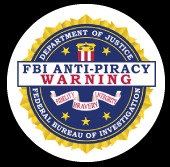 Part # AB6 is an ink cartridge." 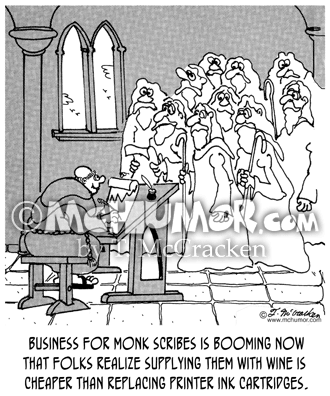 Printing Cartoon 8251: Business for monk scribes is booming now that folks realize supplying them with wine is cheaper than replacing printer ink cartridges. 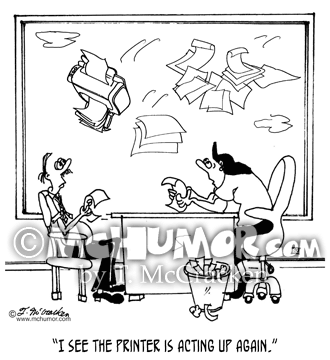 Printer Cartoon 9136: A woman says, "I see the printer is acting up again,” as a printer falls from a window. 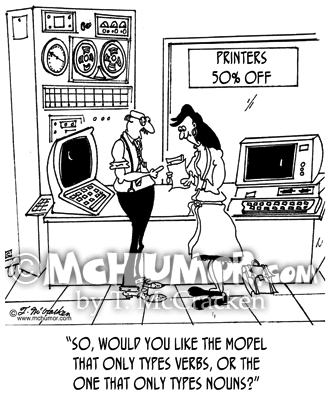 Printer Cartoon 6247: At a sale advertising "Printers 50% OFF" a clerk asks a customer, "So, would you like the model that only types verbs, or the one that only types nouns?" 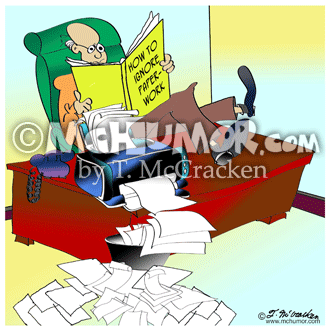 Office Cartoon 8578: A man reads a book, “How to Ignore Paperwork” while a printer on his desk sits over a trash can and sends all pages into the can. 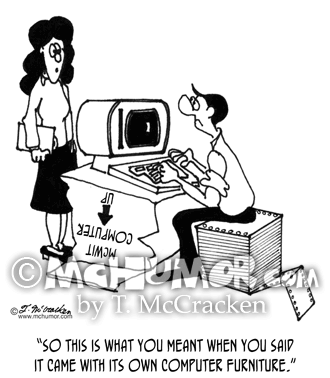 Computer Cartoon 3871: A woman saying to a man sitting on a stack of continuous forms and typing on a computer sitting on a packing case, "So this is what you meant when you said it came with its own computer furniture." 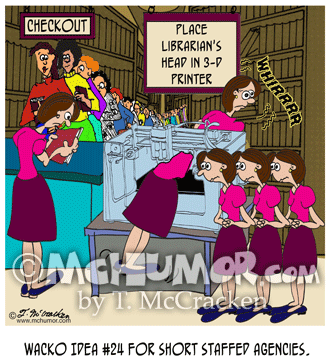 Printer Cartoon 8990: Clones stand next to a machine and sign that says, "Place Head in 3-D Printer." 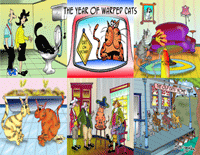 "Wacko Idea #24 for short staffed agencies." 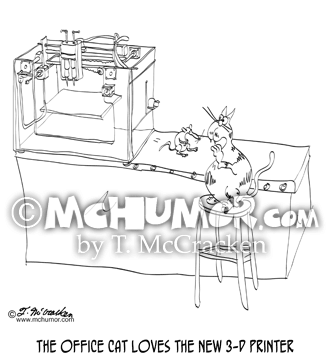 Cat Cartoon 9261: "The office cat loves the new 3-D Printer." A cat looks at a mouse being made. 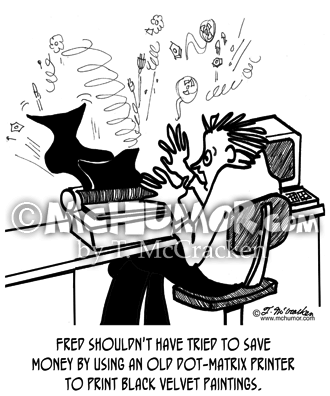 Printer Cartoon 2612: "Fred shouldn't have tried to save money by using an old dot-matrix printer to print Black Velvet paintings." A man's printer blows up.